Just as the Spellbreaker uses the Initiative system for their adrenaline, the Weaver is an Elementalist Elite Specialization that also borrows from the Thief. The Weaver now has the same mechanic as the Thief when it comes to Dual Wield for skill slot #3. The Thief’s #3 slot changes depending on the weapon combination for the main and off-hand weapon slot. The Weaver’s #3 skill slot changes depending on their elemental attunement combination. I tested this Elite spec during the preview weekend and it was a blast, both literally and figuratively. The #3 skill slot has 4 possible combinations for each major element per weapon. For instance, using a sword with both Fire for main- and off-hand, the skill #3 is Cauterizing Strike. Fire + Water makes Twin Strike, Fire + Air makes Pyro Vortex, and Fire + Earth makes Lava Skin. The challenge with the Weaver player is that each main-hand weapon has 6 combinations, a total of 30 (including Trident), plus each skill from Sword for each attunement, a total of 12, so Elementalist will have to deal with mental juggling to remember all 42 freaking skills. Like I said, it was a blast. Fortunately, I have no interest in using other weapons except Sword/Dagger and Staff. The Staff is literally a force of nature and the Devs went full Avatar (again, the cool one not the blue aliens) with it. Having the ability to create a hurricane using Monsoon with Water + Air attunement, again, was a blast. I think I made it quite clear that I had a blast playing with the Weaver. Of course, with every new thing comes with the frustration of learning. The way the attunement cycles is really frustrating for instance, I want to keep fire and I just want to swap from Fire + Air to Fire + Water, well I can’t. When I change to Water, Air becomes main hand and Water becomes off-hand booting Fire attunement out. The way I figured how to do this is to activate Fire first making my attunements Air + Fire, then activating Water to get Fire + Water. Once I found the rhythm to the elemental attunement, it was not bad at all. It feels like I was in pre-school getting frustrated why the circle block won’t go into a triangle hole, but once I figured out how to do it right, it’s smooth sailing from then on. Now let’s look at the other skills, yes, 42 skills are not enough. There is a healing skill, utility skills, and an elite skill. Weaver uses Stance mechanic joining the Warrior and the Ranger stance party. 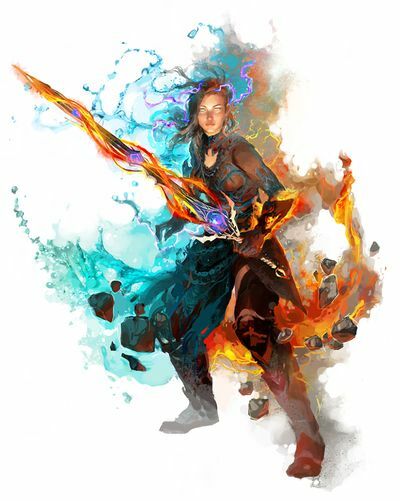 In Guild Wars 1, Mesmer uses the Stance mechanic a lot but it is the Elementalist this time around. Healing: Aquatic Stance – this heal is garbage. It lasts 5s and it comes with a strike cooldown of 1s. So using auto-attack with other weapons other than a dagger, this will only proc 2-3 times. The radius is so freaking small, a ridiculous 240 radius, might as well the Weaver keep it to herself. Utility: All skills are fun to use and I don’t really have anything to complain about it. Elite Skill: Weave Self – I personally think that this is broken. That even though that this skill has a 90s cooldown, the effect of this skill is devastating if used correctly. I have not tinkered with the traits since I didn’t really have enough time that weekend but I will definitely fully explore this when the expansion comes out next week.